Apply for a Paid UW-Extension Internship! 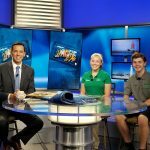 In late August, two Racine County 4-H members were featured on Racine & Me, the local public affairs television program. Click here to hear their 4-H stories and successes through project areas.